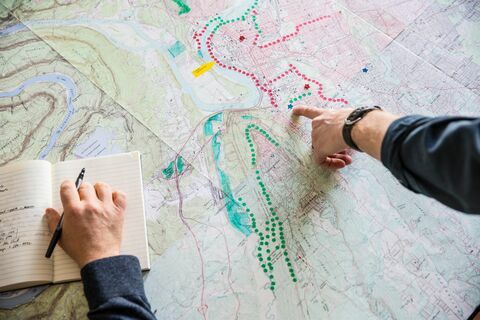 To help guide the next generation of greening work in Chattanooga, The Trust for Public Land employed geographic information systems (GIS) planning and research to develop a resiliency plan for the City. This report provides a rich menu of options for continuing the growth and improvement in Memphis’ park and recreation system, with proposals ranging from relatively quick and inexpensive to long-term and structural. Why are these cyclists smiling? Believe it or not, these are grins for green infrastructure. Chattanooga resident, lawyer, and volunteer Allen McCallie, will be honored this evening by The Trust for Public Land with its highest honor, the Douglas P. Ferguson Award, for his outstanding service and extraordinary commitment to conserving land for people across America. Once called the dirtiest city in America, Chattanooga has become the envy of the South for its thriving economy based on quality of life and easy access to open space. North Chattanooga resident Jim Johnson has made a $50,000 gift to The Trust for Public Land, formally initiating phase two of the Stringer's Ridge park project, the construction of a nearly 10-mile trail system. When Jim Johnson heard that Stringer's Ridge was saved, he realized he could help the city of Chattanooga get a safe new trail along with the land. The Trust for Public Land (TPL) is helping the state of Tennessee extend the Cumberland Trail corridor another 19 miles, while protecting priority land for the public with the purchase of a key tract in the trail's development, TPL announced Sunday.